I looked at another Vector AK47 today where the receiver was welded together instead of riveted. It looked like it was initially riveted, then the rivet heads removed one at a time then TIG welded. The back of the rivets were still there. Looked like just the rivets were welded to the receiver, not the trunions. It was then smoothed and parkerized. At first I didn't even notice the rivet heads were missing, it was a very good looking job. There was slight discoloring where the welds were done. The rest of the rifle looked very nice. Never saw this before. Good, bad, not safe? The price was good and I may want to buy. That sounds like a crappy way to do it. Weld builds are generally looked down upon by AK guys, but if done right, I think a welded assembly would last just as long as a riveted one, but like said, it has to be done right. The HK roller delayed rifles, SIG-55X, AR-18/180, and I'm sure many others have milled barrel extensions welded to a sheet metal receiver by various means. I think I'd still stick with riveted builds as it's known that they hold up in the long run. AKs were designed to either have milled receivers OR riveted ones. Welding wasn't tested or engineered or used by any arsenal that makes AKs. If it wasn't made by Vector I wouldn't even consider it. They are one of the better builder so I wouldn't think they would do something "bad". 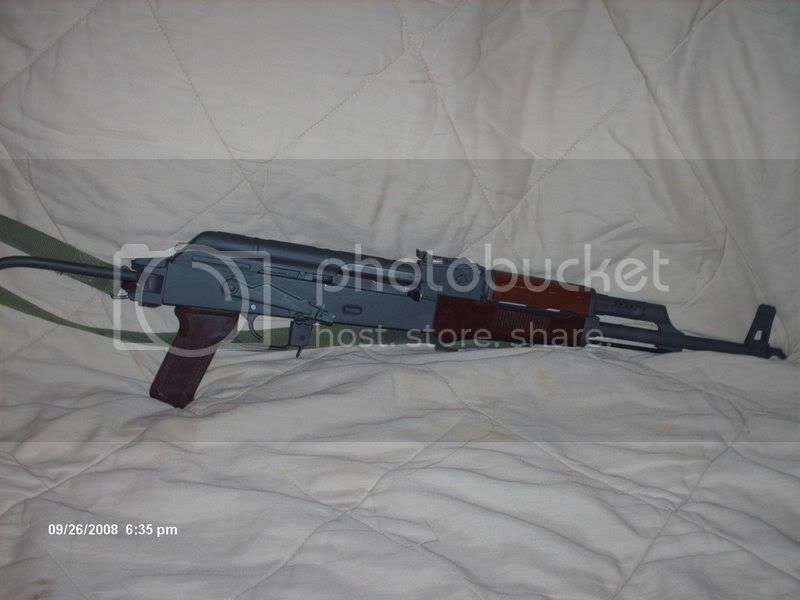 Other than the welds, it was one of the better AK's I've ever seen. I've never heard of Vector welding AKs. It has their stamps on the receiver? Yeah, it said something like "Vector Arms, NSL, UT. I was told it was made 3-4 years ago. The problem with a weld build is that it has to be done correctly. There's no way most of us can tell whether it was done correctly since most people do not have access to the necessary equipment. I have a welded ak, since I know the credentials of the welder. Otherwise, no way. My EG build that I welded. I trust the welder. I doubt Vector did the welding. My Vector, and all the Vectors I have ever seen, had been riveted. It was probably done as a mod by an end user. It's possible. How hard would it be for an end user to parkerize the rifle after they welding it? I'm still tempted to buy it because the price is pretty good and it's a nice gun with matching numbers. Trivial to park if they have the set up. You need a tank, water chemicals, and a burner. My AKS74 was welded by a certed welded with a Miller DC Tig setup. We also used some rivets in addition to the welds. I honestly think this is the most accurate AK i have ever shot or owned, and I am wondering if the fact that it is welded helped on the fact that it superior in rigidity to a rivet build. welding has a myriad of problems. Sure - there are some guns that have welded receivers - the uzi, the AR-18,the G3 - but they were designed for it. the AK was designed for rivets. but more than just the choice of welding, is the quality of weld. It ain't gonna happen with a MIG. Just not enough penetration, particularly when welding to a trunion that is already hardened. Get enough penetration with a TIG and the welding will anneal the locking lugs. You guys really don't get why welds are a bad idea. Just don't put many rounds through it and it'll be fine. It's like playing russian roulette with the functionality and reliability of your AK. I can't imagine why any sane person would want to do this. The same reason people use U-drives - it's a shortcut. It's faster and easier than doing it the right way. I had a Hesse done like that and it was crap. I have heard of welds breaking too. Why was this moved to the "Build it yourself" forum? I was asking about a rifle assembled by Vector Arms. Anyway, I did end up buying the gun last month. The asking price of the gun was very good (really, really good now that Obama was elected). I've shot over 400 rounds through it and it shoots and functions excellent. Very nice finish. I don't know if welding would be any faster than riveting, it looks like it was riveted first then the rivet heads milled off and then welded. The backs of the three rivets locations that you can see on the front trunion all have the backs of the rivets present and it looks like the receiver was welded only to the rivets. Good/bad, dosen't matter anymore since I own it now and like it very much. Oddly enough, there is another welded Vector for sale locally today. The asking price is $1000. I think I pass on that one. Here is a pic of my Vectors (one welded and one riveted). I don't know if welding would be any faster than riveting, it looks like it was riveted first then the rivet heads milled off and then welded. I highly doubt they welded to the rivets. More likely they welded into the rivet hole and then ground it down. Personally I think it looks messy as I can see the welds. I guess you get what you pay for. Unfortunately I wouldn't expect the resale value to be very good either. If it holds up then I guess they are good enough. I can't say for sure Vector welded only to the rivets, but the backs of the rivets are on the inside of the receiver so it's not just the welding up the rivet hole. I have no plans of selling it in the near future so I'm not worried about that.